Celtic have been handed a Champions League reprieve after Legia Warsaw were punished for fielding an ineligible player in their 6-1 aggregate win over the Scottish champions in the third qualifying round. Bartosz Bereszynski, who came on as an 86th-minute substitute as Legia won the second leg 2-0 at Murrayfield on Wednesday night, was suspended following a red card for violent conduct in last season's Europa League. Hours before the draw for the next round was to be made, UEFA announced that Celtic had been awarded a 3-0 win in the second leg, and therefore qualified on away goals after a 4-4 aggregate result. 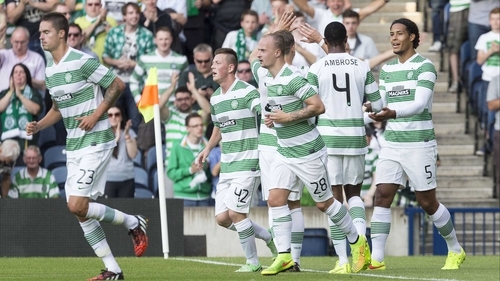 Celtic went into the draw for the play-offs, the final hurdle to reach the lucrative group stages, where they were matched with Slovenian side Maribor. A spokesperson for the Polish club said Legia would appeal against the decision. "This is unjust and completely disproportionate," he told reporters at UEFA headquarters. "There have been similar cases in the past which have not punished in this way. This was just a basic human error. "We have spent eight years working towards this and now it has been taken away from us. Financially, it's unimaginable and the players are shattered." The UEFA statement said: "Legia have been sanctioned for fielding an ineligible player (article 18 of the UEFA Champions League regulations and article 21 of the Disciplinary Regulations). The match has been declared as forfeit meaning Legia Warszawa have lost the match 3-0. "As a consequence, Celtic have qualified for the UEFA Champions League play-offs on away goals (agg: 4-4) and Legia will compete in the UEFA Europa League play-offs. "In addition the player Bartosz Bereszynski has been suspended for one additional UEFA competition match for which he would be otherwise eligible. "This suspension shall be added to the remaining two match suspension which the player still has to serve in accordance with the Control and Disciplinary Body decision of 13 February 2014." Bereszynski was sent off against Apollon in the final match of Legia's Europa League campaign last season, earning a three-match suspension. He missed both legs of Legia's tie against St Patrick's Athletic in the second qualifying round and also sat out the 4-1 first-leg victory over Celtic. However, it has emerged that Bereszynski had not been registered in Legia's squad for the second qualifying round, and so the matches did not count towards his suspension. In 2010, UEFA fined Hungarian side Debrecen £15,000 for fielding ineligible substitute Peter Mate while they were leading Litex Lovech 4-1 on aggregate late on. In that case, UEFA decided Debrecen had "no interest in fielding this player for the three last minutes of additional time, when the score was so clearly in its favour". It is the second time in three years Celtic have benefited from an opposition administrative mistake. They were reinstated to the Europa League after losing to Sion in 2011 and appealing the Swiss side's use of five ineligible players. Sion had signed the players despite being under a FIFA transfer embargo. Celtic manager Ronny Deila has also commented on Celtic's dramatic reinstatement. Speaking at the club's Lennoxtown training complex Deila said: "It is very strange, I have to say that. "First of all I feel very sorry for Legia, and my friends from Norway there. "It is tough to think of that and now we are in the Champions League. "That is what UEFA said, we haven't been involved in anything. "I am a football manager and I have to go with it and now we are preparing for Maribor."